We return this week to well-explored but highly deserving adventuring territory, as we venture deeper downward into danger with Infocom's ZORK II: The Wizard of Frobozz. This was the second subset of the original mainframe DUNGEON adventure created by several principals of Infocom, published for microcomputers as the ZORK trilogy. This chapter is credited to Dave Lebling and Marc Blank, copyright 1981-1983; I'm playing Version 48 for IBM PC DOS, available these days for free download courtesy of Activision. The ZORK series probably needs no introduction, but for those few brave souls just now venturing into these classic text adventures, suffice it to say that the games are set in an underground world full of traps and puzzles. The object is to use low (and high) cunning and daring to retrieve a series of treasures, and in this chapter, face down the mischievous and dangerous Wizard of Frobozz. The Infocom parser was renowned in its day for its sophisticated recognition of English language constructs, and is still in use today by authors of non-commercial interactive fiction. 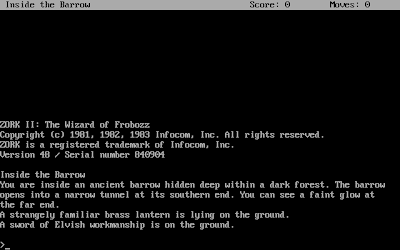 The story of ZORK II opens with the player standing Inside the Barrow, following directly on from the end of ZORK I. Our "strangely familiar" brass lantern and sword are on the ground, and we would be foolish not to take these basic adventuring tools with us. We will likely encounter the titular Wizard of Frobozz fairly soon -- he appears from time to time, and casts various random spells at us, generally beginning with the letter F; for example, Fear! or Freeze! or Fantasize! or Fall! or Fence! or Fireproof! Most effects are temporary, although we need to be careful about moving around under magical influence; some of these, as one might gather from the names, are harmful, while others are actually useful or at least experimentally interesting. One nice apparently useful feature is that, if our lamp runs out, the Wizard is likely to appear and cast Fluoresce! on our person, eliminating the need for a non-magical light source. But we don't want this to happen, for reasons that will not become apparent until the very, very END of the game. No ZORK dungeon would be complete without a little intentional disorientation, and in this chapter the Carousel Room provides plenty of confusion -- when we try to navigate away from this location, we are only randomly likely to actually end up where we were trying to go. Once we arrive in a new location, we can figure out its actual relationship to the Carousel Room based on the available exit. But mapping is quite a challenge until we figure out how to stop the room from spinning. 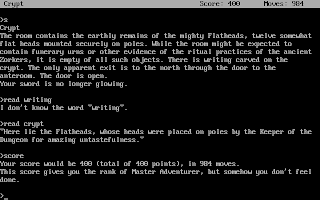 The world of ZORK overflows with charming, incongruous detail, and here we find a topiary garden and a pleasant Gazebo, which contains a matchbook, a china teapot, a place mat, a newspaper, and a letter opener. The newspaper is still titled U.S. News and Dungeon Report, as it was in the original mainframe DUNGEON, but has been moved from ZORK I's white house to this location, to make it available in ZORK II where it's needed. We will also discover that the Marble Hall now contains the square brick which feels like clay, originally stored in the Attic of the white house. A unicorn resides at the north end of the garden, and closer inspection reveals a tiny gold key on a ribbon around its neck. One sensible idea doesn't pan out in the parser's immutable opinion -- Strange concept, cutting the ribbon -- so we're not going to get the unicorn's key from around its neck that way. Our enchanted sword glows in the presence of the unicorn, but it's no enemy; for the first time we may realize that the sword is sensitive to the presence of magical creatures, not necessarily evil ones. The topiary animals at the south end of the garden change position slightly over time; eventually they close in and become menacing, and the roses growing here refuse to let us pick them, so we shouldn't spend too much time hanging around. To the south of the Carousel Room is a Cobwebby Corridor, containing a coil of black string. Further south, the Guarded Room contains a door, guarded by a lizard head. I thought the lizard might be illusory, as attacks with the sword don't seem to land in any visible way, but it's just magically protected from such crude attempts at a solution. We will need a specific item to gain safe passage. The famous, now-defunct Bank of Zork has a Teller's Room, a couple of Viewing Rooms, and a Safety Depository. Magic prevents valuables from leaving the Depository, courtesy of the Frobozz Magic Vault Company, naturally. There's a shimmering curtain of light in the Safety Depository, and the central puzzle here is discovered when we ENTER CURTAIN to find ourselves in a small room with no listed exits; the apparently solid walls are labeled north, east, west, and south. We hear that the Curtain Door closed, and then a teller gnome appears. We can't kill the gnome; eventually he gets impatient and leaves. We can give him an object (only a valuable one though, others get tossed into oblivion), at which point he puts it in the safety deposit box and escorts us out of the room, but we don't really need to do that either. We can exit south through the wall, the way we came in, despite the fact that no such exit makes itself apparent. Further experimentation establishes that we can actually go to the West Viewing Room, the East Viewing Room, or right back to the Small Room. The game tells us that I'm suddenly a little unsteady... after passing through the curtain of light, which led me at first to think that navigation was randomized after doing so, explaining the apparently inconsistent behavior upon exit, but it's nothing that unpredictable, as it turns out. I had to resort to the official Infocom Invisiclues (from the Lost Treasures of Infocom collection in my case) to obtain a critical hint -- our destination when we leave the Small Room is determined by the direction from which we entered the Safety Depository. So there's a fourth destination available upon exit that's not otherwise accessible -- to reach it, we have to come in from the south to end up in the Small Room, then enter the Safety Depository from the north, then go through the curtain again to reach the well-secured Vault. Its contents: 200 neatly stacked zorkmid bills, a sizeable if mundane treasure. However, when we try to leave the Vault, alarms go off and we are killed immediately, unless we exit through the Vault's NORTH wall, in which case we are merely prevented from leaving with any ill-gotten valuables clutched in our greedy adventurer's hands. But there's a flaw in the security system, as it only triggers when we've entered the Vault; we can leave things in the Small Room temporarily, come in again from the east or west, take the treasure(s), and walk blithely through the wall to the Viewing Room to make our escape. Whew! The Infocom parser is pretty sophisticated, but is still prone to the occasional inappropriate default response -- LOOK UNDER WATER yields There is nothing but dust there. The Menhir Room leads to the Oddly-Angled room, a maze unto itself. There's a club lying on the ground, bearing the legend "Babe Flathead"; it's visibly scorched, which gives the impression that it might be a torch. We can actually light it using the matchbook from the Gazebo, and it burns readily, but that's a potentially game-losing move, and not what we're meant to figure out. The diamond-shaped window on the floor is another clue, and directions in the Oddly-Angled room are not consistent with the rest of the map; navigation here is limited mostly to the diagonals. It seems this is a baseball-themed puzzle; the club is in fact a baseball bat, or an approximation thereof. I had the right idea here, but my attempt to "round the bases" was unsuccessful, as I didn't have the right orientation and starting point in mind for the diamond. I went NE, NW, SW, SE, and the game wants us to start going SE, then NE, NW, SW. You hear a strange rusty squeal echoing in the distance, and now we can access the Cerberus Room. Here, we can't seem to KILL CERBERUS WITH SWORD; no matter what we do, he snaps at you viciously! So we'll have to come back here later and try something else. We can't use the letter opener to pick the keyhole in the Tiny Room, but we can insert it into the keyhole, to no immediately apparent effect beyond kicking up a little dust. We can't unlock the door, but we can open the window mounted in it; even then, we can't really see much that's of use inside the room. I should have recognized this classic adventure game trope, but what we have to do is use the letter opener to push a key out that's inserted from the other side, sliding the mat under the door beforehand so we can retrieve it. The in-game clues here are fairly subtle; if we insert the letter opener, we see some dust, presumably arising from the key falling out; if we examine the keyhole, we learn that No light can be seen through the keyhole as another clue. But I just didn't get this one on my own, for some reason; that's why the Infocom Invisiclues came in so handy back in the day. What is tall as a house, round as a cup, and all the king's horses can't draw it up? I really enjoy these kinds of riddles in fantasy literature and pencil-and-paper RPGs, but in adventure games they are often frustrating because alternate, potentially satisfactory answers are not what the parser is looking for. Before hitting the Invisiclues, though, I gave this one some thought. My first attempt was... ANSWER "A PERFECT CIRCLE", which led me briefly down a rabbit hole because the parser actually recognizes the words in that phrase. It responds with A hollow laugh seems to come from the stone door, not a dictionary error, nor progress, but clearly I was on the wrong track. I tried the SUN and the MOON to no effect either. Going back to the perfect circle idea, I wondered if I needed to draw it somehow, maybe with a crude compass fashioned of string and... the burned bat... and... nope. Sigh. I tried to ANSWER "THE MOON'S REFLECTION", also to no avail. Hmmmmm. Well, we're burnin' daylight down here -- the Invisiclues (a soupcon of aha!) tell us that we need to ANSWER "A WELL" and get on with our quest. Past the Riddle Room, we find the Pearl Room (containing a valuable necklace) and the Circular Room, containing a huge bucket. There are some etchings on the wall which appear to describe a puzzle here -- a grail shape and a pedestal. But we'll come back here later to explore. In the Dragon Room, we can't simply KILL THE DRAGON WITH THE SWORD; it just annoys him. If the Wizard has recently cast Fireproof! on us, we can irritate the beast until the dragon's fire washes over you harmlessly, which is fun but not particularly productive. What we need to do is attack the Dragon just enough so that the creature is sufficiently annoyed to follow us to the Ice Room, where he conveniently attacks his own reflection in the glacial walls, dying in the process and clearing away the ice. Cool! Or, I suppose, Warm! Now we can access the volcano bottom, where a relatively complex mechanical puzzle presents itself. In the bottom of the volcano sits a wicker basket with a cloth bag, a metal receptacle in the center, and a braided wire dangling from the basket. Is it a balloon? Yes; we can burn the club, if we've solved the baseball puzzle; otherwise we should use the newspaper or something else both flammable and disposable. Putting this improvised fuel in the metal receptacle causes the bag to inflate, as a small label drops from the bag into the basket, imparting the critical information that we will need to explicitly LAND at some point. Climbing into the basket, we begin rising up the volcano; further experimentation establishes that we can close the receptacle lid to cool the balloon and descend. Our fuel will eventually burn out, so we must take some care not to let the balloon deflate at a dangerous elevation. We can land the balloon on a Wide Ledge near the volcano's rim, and tie the braided wire to the conveniently-placed hook -- if we don't, we will find ourselves stranded very shortly. One minor bug here -- after we leave this area, the ledge collapses, but the description from the air still indicates that there is a place to land on a wide ledge. Taking a balloon ride above this point proves fatal, as high winds eventually blow us into the Flathead Mountains -- but we do note in passing (get it?) that In a clearing stands a white house. In DUNGEON, one could navigate between these areas via a safer route, but in ZORK II this is just a reminder of where our journey began in ZORK I.
I ran out of ideas for things to try at one point, so I checked the Invisiclues for a general tip, and learned that Burning the brick will make its use apparent. So I tried that, blowing myself to smithereens in the process but establishing with a strong degree of confidence that the brick is a plastic explosive. We can INSERT STRING INTO BRICK, and light the crude fuse, giving us time to escape before it blows. I tried blowing up the mass of ice in the Ice Room -- no go -- and also established that it can't be used against the Guardian Room's lizard head. In random rocky locations, I discovered that The room trembles and 5000 tons of rock fall on you, turning you into a pancake after injudicious use of the explosive. We can also inadvertently leave a path blocked with debris, altering the map and potentially preventing ourselves from finishing the game. But the volcano area provides a good opportunity to use it -- I thought at first that it was no good for blowing open the rusty box in the Wide Ledge area, as when I left it in the room to go off, nothing notable happened. But if we discover the hole in the box, and INSERT BRICK IN HOLE after lighting the fuse, the blast liberates the box's contents. It also destabilizes the immediate area, so we need to grab the crown and card thus revealed, and get out quickly. With the dragon dispatched, we can stroll through the Dragon Room to enter the Dragon's Lair, where we discover a beautiful young woman (who is not named Princess Daphne.) If we KISS WOMAN and then follow her like a lovesick puppy, she goes to the gazebo, and when the unicorn appears, puts the ribbon around its neck in her hair, giving us the key and a perfect rose (which is why my attempt at a PERFECT CIRCLE for the riddle was recognized earlier.) Then she departs, riding the unicorn side-saddle in royal, ladylike fashion. Back to the lizard head -- it will gladly eat the rose if we offer it, but the snack doesn't make it any more pleasant to deal with. Turning our attention to other pending puzzles, we can discover that the gold key the princess gave us doesn't fit the Tiny Room lock, but does unlock the Guarded Room door. But the lizard head is still in the way. In the Tiny Room, opened with its own key retrieved using the mat-and-letter-opener trick, we can look into the blue sphere, and see a Murky Room with a sandy floor and nicely dressed stone walls. We can take the sphere with us, though its purpose is unclear at this point. The bucket in the Circular Room has a purpose I had not yet discovered; the Invisiclues (again!) inform us that we can pour water in the bucket in the well, using the large bucket as an elevator. This begins to make sense now -- a partial, cryptic message written on the bucket is actually the remnants of a logo for the FROBOZZ MAGIC WELL COMPANY. We pour water into the bucket to go up, and collect it again to go down; but if we dawdle too long, the water in the bucket will evaporate, sending the bucket down again whether we are onboard or not. The area at the top of the well has a distinctly Alice in Wonderland vibe -- a Tea Room contains a long table set for tea, and pokes fun at those mundane others with whom the Implementors likely had to deal, noting that the users were indeed mad. There are cakes here frosted with green, red, orange and blue letters, and a little Lewis Carroll-inspired experimentation will prove valuable. But before eating any cake, I wanted to check out the robot in the Low Room nearby. A piece of paper here indicates that we can command the robot to execute actions via the parser -- this feature emerged very early in Infocom's life, and would prove central to some later games (like Suspended) and puzzles. There's a cage guarding a red sphere that tends to fatally trap us if we try to steal the sphere. We can get the robot crushed by the cage instead, but that doesn't help us retrieve the item -- what we need to do is command the robot to lift the cage off of us after it comes down. We can also order the robot to push the round, triangular and square buttons in the Machine Room -- they fry us with electricity if we try to do so ourselves. The triangular button apparently transfers the disorienting spin from the Carousel Room to the Machine Room area, making our remaining explorations a lot more predictable, and also causing a steel box to appear in the Carousel Room, containing a fancy violin. What we don't want to do is turn up the speed of the activity here with the square button; the centrifugal force tends to be fatal. There's also an EBCDIC joke here, retained from DUNGEON, referring to IBM's non-standard, non-ASCII character set and probably more relevant at MIT than to the public at large. Back to the Tea Room -- the cake with green letters says "Eat Me," and we can use it to shrink down and reach the Pool Room through a small Alice-inspired door. We drown if we enter the pool at this size, and this fate cannot be avoided by reducing our inventory weight. We can't quite read the other cakes' lettering, but we can discover that the orange cake blows us up (Explode Me, perhaps? ), the red cake dehydrates us (Evaporate? ), and the blue cake causes us to Enlarge, but it's too cramped to do so in the Pool Room so that's of no help. There's also a flask with skull and crossbones here -- even opening it proves fatal as we are overcome by deadly fumes, so we should leave it alone per the indications on the label. What to do now? Oh, of course -- we can toss the red cake into the pool, and cause the water to evaporate. Now we can retrieve the Frobozz Magic Candy Company >>Special Assortment<< Candied Grasshoppers / Chocolated Ants / Worms Glacee, which may interest the lizard head. Giving the candied insects to the lizard head allows us to get into the Wizard's Workshop (after also unlocking the door with the gold key). Unfortunately, while there are many tempting magical accoutrements and stolen adventurers' weapons on display, we can't take the used wands or open the case; we can't touch anything in here, really. We don't really need the sword after we've annoyed the dragon, but if we lost it to the Wizard via the Filch! spell earlier, we will find it here in the Wizard's Workshop, woefully out of reach. Another bug turns up here, though -- even after we've obtained the Wizard's Wand near the end of the game, we can't actually FILCH back the sword! While the parser dutifully prompts us to specify "the sword or the nicked swords? ", it doesn't seem to successfully differentiate. I'm sure we'll be given another one at the start of ZORK III. We can explore the Wizard's area to discover the Wizard's Workroom, the Aquarium Room, the Wizard's Quarters (with magical, ever-changing decor), and the Pentagram Room. We can't enter the pentagram, which is probably just as well. We can break the aquarium glass by throwing something at it, but we can't ENTER AQUARIUM afterward, suffering incredibly rapid blood loss just from walking on the broken glass. After the water is drained, though, we see the previously invisible clear sphere, and can fortunately just take it without actually stepping into the hazardous zone. The mysterious spheres' purpose becomes clear at last, now that we have three of them and have gained access to the Wizard's Workroom. Putting the three spheres in place here creates a black sphere, and we can THROW BLACK SPHERE INTO PENTAGRAM to summon a demon -- this is the creature we encounter in the black misty area when we die, if we've explore the rooms of colored mist after shuffling off this mortal coil. The Wizard now enters the room and incants, "Frobizz! Frobozzle! Frobnoid!" But the demon is now out of his control, responding in presumably stentorian, demonic and righteously liberal tones, "My fee is not paid! I perform no tasks for free! We demons have a strong union these days." With the demon's demands satisfied, we can say, DEMON, GIVE ME THE WIZARD WAND. This does not, however, work as expected -- even the Z-machine has problems when a noun can be used as an adjective. DEMON, GIVE ME THE WAND has the desired effect. With his source of power thus confiscated, the Wizard of Frobozz cries "Fudge!"... and there's suddenly a strong odor of chocolate in the air, as the Wizard flees in terror, a funny if slightly scatological gag. Now that we have the Wizard's Wand, we can use its powers to wrap up the story in fairly short order, once we figure out how to use it. There is no CAST verb implemented; do we just say the name of the spell, with no target specified? Ah -- we WAVE WAND AT [object], then SAY "[spell]". The quotes are syntactically significant, and the wand explodes if we overuse it, wreaking random magical havoc as we die and restore. Back to the Menhir Room -- we can now cast "FLOAT" on the large menhir, and The passage beneath it beckons invitingly. But ENTER PASSAGE gets confused here, yielding only, Which passage do you mean, the tunnel or the way? We just need to travel SW, actually. We can now reach the Kennel, which contains a huge dog collar large enough for three rhinoceros-sized dogs. It seems that this might work on Cerberus, and yes, he becomes quite enthusiastically friendly once his collar is on. Now we can reach the Crypt: "Here lie the Flatheads, whose heads were placed on poles by the Keeper of the Dungeon for amazing untastefulness." And there are indeed a number of similarly-featured heads on pikes here, with which we can and need do nothing; that's really no problem as far as I am concerned. Having reached the crypt, we have scored all 400 points; but somehow you don't feel done, according to the SCORE command. Clearly, there is a final task to complete -- but if we have run out of light earlier, the Wizard's Flouresce! spell cast upon our person, in the classically insidious and maddening Infocom tradition, now prevents us from finding the final, secret door. We have to turn off our artificial light source so that we can spot its outlines glimmering in the dark; opening the secret door leads to a landing, the gateway to further adventures in ZORK III. I found ZORK II to be quite a bit more difficult than ZORK I, but fair; the puzzles are more sophisticated and involved, and there's still plenty of skulduggery and humor to keep the pacing lively. I like that, while treasures must be collected in the usual manner, in this game they're strictly a means to an end -- our real goal is to explore the world and discover its secrets. There's one chapter of the original trilogy remaining; onward and downward we go! 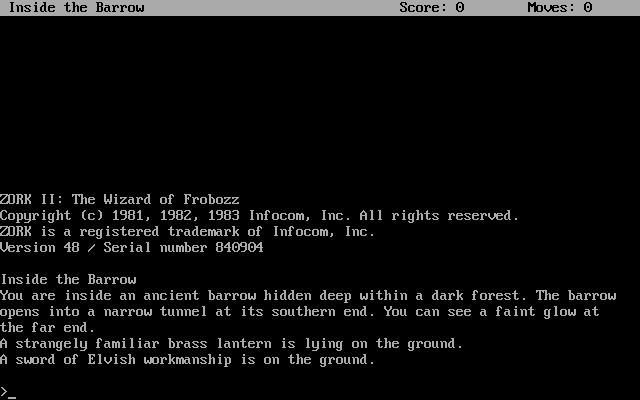 Ah Zork II - probably my favorite text adventure back in the day. 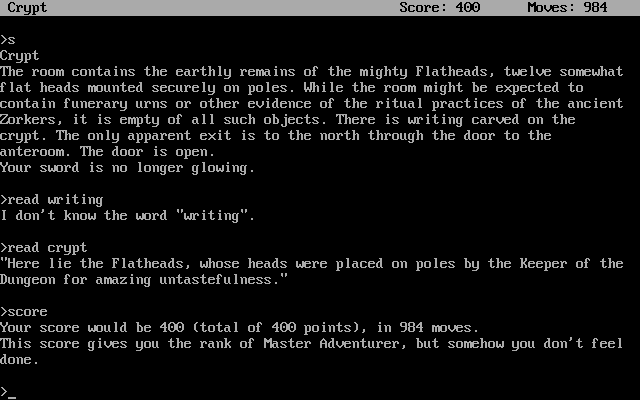 I too found it more difficult than Zork I, but not so much so that it was insurmountable. I have forgotten a great deal of the details about the game, but I remember that a friend and I were both playing it at the same time and would compare progress each day at school. Worked through a few of the puzzles that way too. A fun collaborative effort in the pre-internet days of Infocom. And who wanted to spring for an Invisclues book??! In my opinion Zork II was the peak of the trilogy, Zork I was second (arguably first as the progenitor), and Zork III was last. I recall being rather disappointed with the Dungeon Master.